Hundreds of Coca Cola workers sporting red T-shirts shouted, sang and marched into Madrid’s historic central square on July 18 to demand the return of their jobs. I was among dozens of Canadian, American and Australian tourists who encountered this instance of class struggle following our tour farewell dinner in the square. I spoke to Comisiones Obreras (CCOO) union organizer Daniel Andres Sobrino about the issues in dispute with the soft drink giant. He told me that Spain’s national labour court overturned Coca Cola’s dismissal of 1,190 workers in that country. The decision was a big boost for the union-led campaign against four factory closures in that depressed economy. The Audiencia Nacional also called for the workers’ reinstatement and payment of lost wages. Coca-Cola Iberian Partners, a new Spanish subsidiary of the US multinational formed from the merger of eight bottling plants, had shown ‘a complete and manifest breach of the obligations’ to provide information, and to consult and negotiate procedures, the court found. The court also agreed with the applicant unions that the company had unlawfully tried to break the strike at the Fuenlabrada plant in a bid to undermine the workers’ “constitutional rights”. The company is appealing the decision to the Supreme Court. In February the CCOO, UGT and CSIF unions launched a legal challenge after the company decided to push ahead with its plans to shut down plants in order to cut costs. 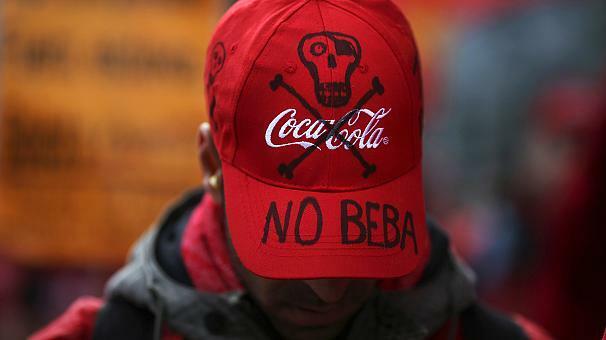 The workers urge a boycott of Coca Cola products until their issues are resolved. CCOO blames the dispute on the Spanish government’s 2012 labour law reform, which made it easier to fire workers. A deep downturn, aggravated by austerity policies over the past five years has pushed Spain’s official unemployment rate up to 26 percent. The workers’ campaign has resulted in many consumers boycotting the popular beverage. According to El Economista, in central Spain, including Madrid, sales diminished by 48.6 percent between February 28, 2013 and February 28, 2014. The company has tried to minimise the effect of the boycott campaign, arguing that in February 2014 alone sales fell only by 2.3 percent. According to the unions, the biggest drop occurred in the second half of January, when the redundancy plan was announced. However its plans floundered when the court ruled that Coca-Cola Iberian Partners had failed to present the union negotiating committee with a detailed account of its re-organisation. The court declared void the plan to make 1,190 workers redundant, of whom 821 had actually been laid off, and to close the plant at Fuenlabrada (Madrid), as well as in Majorca, Alicante and Asturias. It ordered the company to reinstate hundreds of workers and to issue back pay. At its headquarters in Atlanta, Coca-Cola said it was disappointed with the ruling, adding that its bottling partner intended to appeal. Coca-Cola’s 2013 fourth-quarter profits totalled $1.7 billion euros. Previous PostNDPers petition to remove Ontario Leader HorwathNext PostJustice for Palestine!